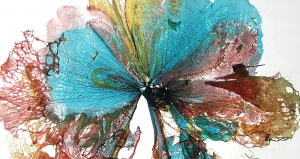 Located in the Visitor & Administration Building, Queens Botanical Garden’s art gallery presents four exhibitions per year, featuring a variety of media created by local artists. QBG IS ACCEPTING GALLERY APPLICATIONS, CLICK TO APPLY! 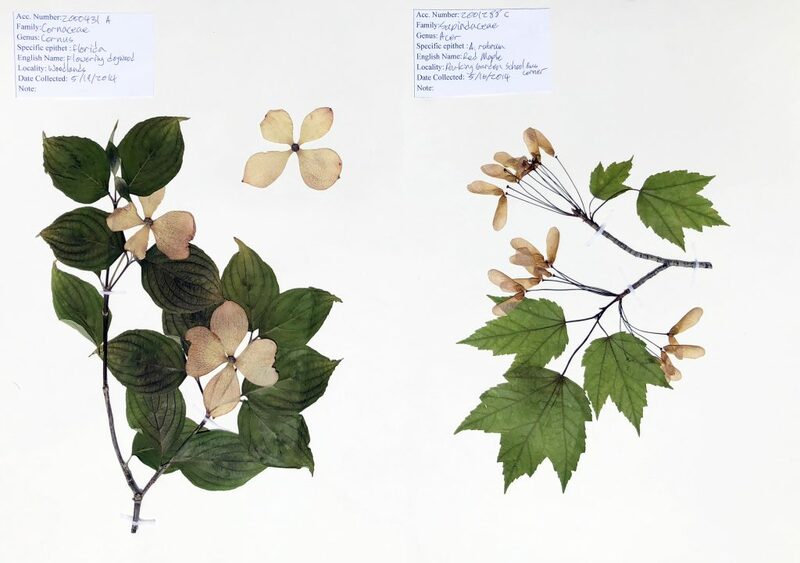 In Full Bloom presents the work of three artists, Darya Warner, Amber Vittoria, and Jamie Pesavento, who create work inspired by the shape and form of flowers and bodies in nature. Stay tuned for artist events and more details! Utilizing plastic shopping bags, Nancy Paola Paredes creates collagraphic prints challenging our conception of nature while bringing to light the dangers of our daily use of plastic. Plastic becomes a vehicle to discuss the pollution of our physical home and a portal to the recognizable yet unknown landscapes of our memory. Organic Emergence was curated in partnership with Samadhi Advisors. Photographers group inspired by the botanical world and its impact on human life through all seasons. 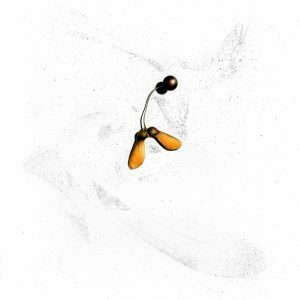 In HOPE Laura Fantini’s intricately detailed pencil drawings of seeds, which she has collected throughout NYC and Italy, explore the fundamental power of seeds, new beginnings, and growth. 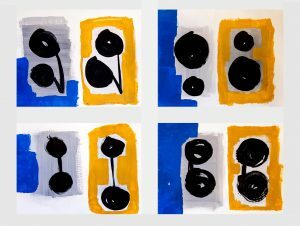 Through his paintings in Borderlines, artist Shahryar Shahamat shares his experience—boundaries and challenges—as a resident of New York City for the past seven years. 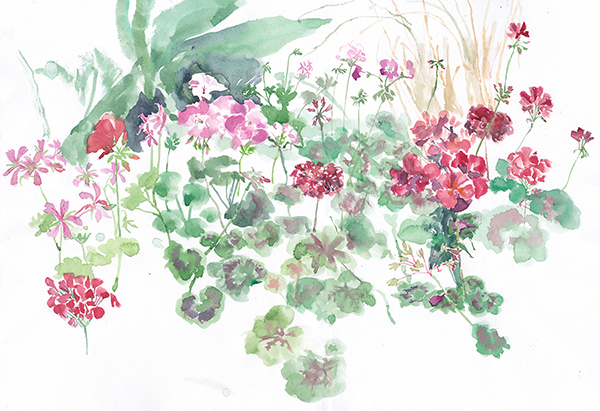 Sitting with the Garden is a collection of site-specific watercolor paintings by Che Min Hsiao, a Taiwanese painter based in Queens. Viewers will experience the beauty of Queens Botanical Garden filtered through the artist’s memories of nature in Taiwan. The Structure of Nature exhibited over a dozen paintings and a site-specific mural that fuse his modern, graffiti-style paint application with QBG’s LEED™ Platinum Certified Building through traditional still life and landscape subject matter. 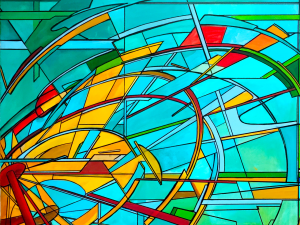 In addition to exhibiting in galleries and creating murals, Zimer received his BA in architecture. 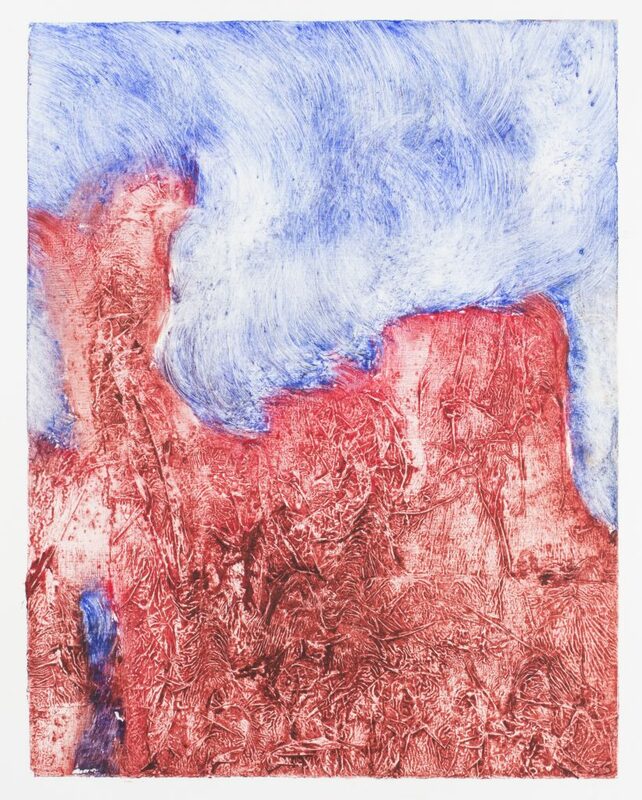 His studio practice has included sculpture, fashion, furniture, animation and graphic design. 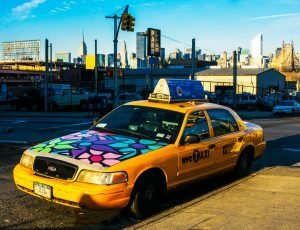 Zimer has painted murals all over the world including: The New York Auto Show, Comic Con, The World Trade Center, Philadelphia Tattoo Convention, London’s South Bank, and the Northside Arts Festival. Queens based photographer, Vikram Dogra has lived in Astoria since 2000. He arrived as an immigrant from India in 1982 and has lived in West Virginia, North Carolina and Washington, DC. In the cradle of the multicultural landscape of Queens he found a place to love and belong. East of East River began as a photo series recording the unique makeup of both landscape and the people of Astoria and Long Island City and, eventually became a self-published photography book in 2015. These photographs capture a changing landscape of the neighborhoods from 2004-2015. The photographs combining street and fine-arts photography offer a unique and historical portrait of the ever changing neighborhoods. Artist Manuel Macarrulla exhibits hand-crafted masks, drawings, and paintings inspired by carnivals and fantasies that incorporate nature and animal imagery, as well as his Dominican heritage. 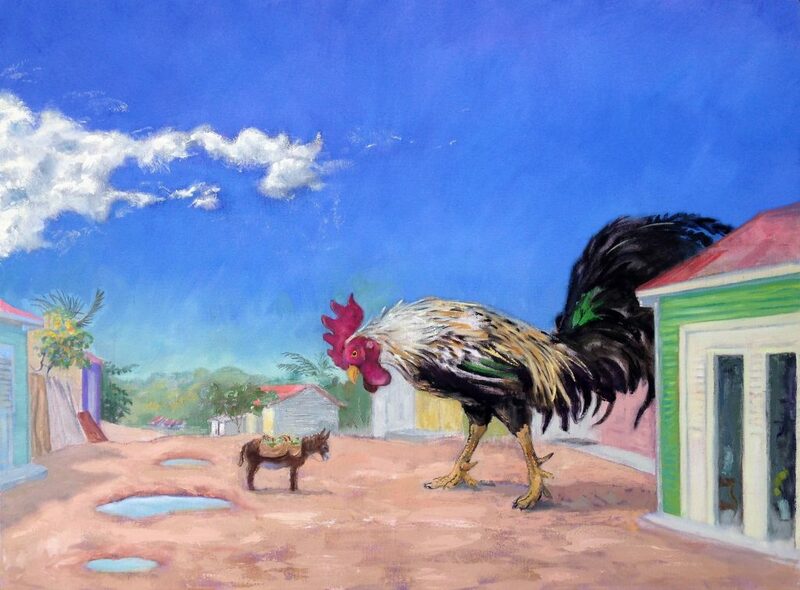 As a younger painter, I discovered my native Dominican Republic and the fantasy of the Dominican carnival as a subject. This was a natural part of my growth process, the arrival at images of self identity. As I continued to develop, I found that my love of the magic realism of such great Latino writers as Gabriel García Márquez also entered my imagery. These aspects of my work have remained constant. I continue to sheathe my other worldly spectacles in realism. These days, I continue to look back to my beginnings for subject matter, but also find that cosmopolitan New York City continually offers the cultural expression I seek. The Spanish language and the natives of all of Latin America are everywhere. The office where I work is two short blocks from Eastern Parkway, where every September first, I wander on a lunch time stroll through the thick of the great cultural hurricane that is the West Indian carnival. There’s a subject! Of course, all of this is not simply intellectual. I choose this subject matter the same way you reach for the plate of curried goat, or a mango, because you like the flavor. Although, let’s recognize, this choice will have great resonance as a taste determined by your culture. The flavor, the fragrance, the texture, never fails to bring back a sense of home. 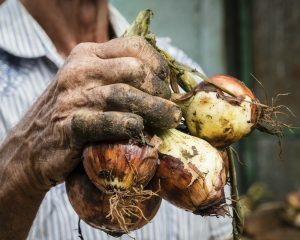 The rhythm of the merengue, the hot Caribbean sun, and the lilting intonations of the country people I knew as a child stir in the recesses of my heart with every bite. 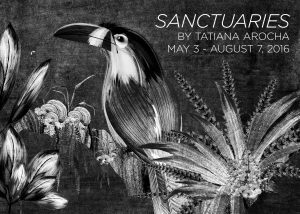 Visual artist Tatiana Arocha’s SANCTUARIES is a series of large-scale, intricately-layered reinventions of natural Colombian landscape, hand-constructed on digital canvases, printed, and arrayed into immersive murals. Both refuge and warning, SANCTUARIES uses a combination of natural specimens, human artifacts, and modern technologies to evoke a rainforest that is as lush as it is imperiled. Tatiana Arocha is a visual artist from Bogotá, Colombia based in Brooklyn, NY. A graphic designer by training, Arocha’s work spans illustration, motion graphics, live action production, curating, education design, site-specific art, product design, and publishing. She combines passion for storytelling with attention to detail, a fearless work ethic, and refined sense of style developed over years working in design. Today Arocha is focused on SANCTUARIES, a series of wall-scale intricately-layered reinventions of the natural Colombian landscape, hand-constructed on wall-sized digital canvases, printed, and arrayed into immersive murals. Tatiana Arocha’s work emerges from a personal history enmeshed in the bio-political landscape of Colombia, which she spent her childhood exploring on expeditions with her father, an anthropologist and environmentalist. Both a refuge and warning, SANCTUARIES uses a bewildering combination of natural specimens, human artifacts, and modern technologies to evoke a rainforest that is as lush as it is imperiled. Black-and-white images recall 18th century engravings, threatening a future in which rainforest is relegated to history. Gray overtones reference the U.S.-funded campaign of coca eradication, which blanketed the rainforest with a layer of ashen dust. Gold conjures wealth unfixed to currency, underscoring the dilemma of natural riches compromised by thirst for capital. Arocha’s work interrogates boundaries between preservation and imagination. She both continues and bends the arc of life and decay, evolving specimens beyond their moment of capture and recasting natural forms in possibilities of her own devising, presenting a rainforest at once realistically lush and built of components beyond reality. These mutations are inherently political; by reshaping the colonial source image, Arocha unshackles the South American specimens from their Spanish classifications, freeing them to be re-interpreted outside the regimented and alien bodies of knowledge to which they were consigned. The Portraits of Tall Friends exhibit is a valentine in sculpture and photography, inspired by the amazing, abstract beauty of trees that live among us. It celebrates TreeSpeakArtist Frank Buddingh’ and photographer Carol Reid’s life-long bond with trees, and invites you to experience these great friends of mankind as remarkable works of art. ­­Trees have always been the golden thr­­ead woven through the tapestry of my life. Having encountered thousands of trees over the span of my cherished fifty-year career as an arborist, trees never cease to inspire. Caring for trees, protecting their unique habitats, enabling their glorious appearance to flourish while ensuring their environmental needs are met are tasks central to my professional career. As such, trees also have inspired my passion as an artist. Trees, the grandest of plants to pepper our Earth, enable life to exist. Trees purify the air, help to oxygenate our lungs, afford protected habitats to wildlife and safeguard our land from erosion and flooding. Eliminate trees and life becomes impossible. Our children and children’s children will have no choice but to inherit the unimaginably devastating consequences associated with society’s blatant disregard of these essential beings that share our planet. It is also essential to remember there are a host of other creatures depend on trees for their daily existence as well. As long-standing sentinels in a historic landscape, the lifespan of a tree dances to a different rhythm along the path of time. We fail to understand that we are the cause of this peril as we subject their roots, trunk and branches to neglect and abuse. They are also most vulnerable to attack by infestations and severe weather conditions. With my TreeArt, I arrange found parts of trees as sculptures and collages that hopefully please the eye. 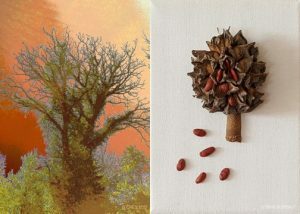 Each of my creations in this exhibition will have a description to help you discover the tree. You may choose to purchase a piece and give it new life in your home, or perhaps my TreeArt will inspire you to go outdoors on a discovery walk of your very own amongst the trees. My wish is that my Tall Friends also become yours. They stand with pride and grace, heads high, their profiles traced against the sky in all seasons, the most lyric form of poetry in nature. Trees cheer us with the promise of life’s cyclic renewal every spring, offer shade in summer’s heat, shelter to communities of birds and their nestlings, challenging aerial highways and secret stashing nooks to the enterprising squirrel population. Their moss- and lichen-speckled trunks bear lasting scars of countless beak and insect strikes, remnants of searches for food harbored within. Their powerful roots hug the earth with the intensity of a babe suckling at its mother’s breast. Mindless of our concern, they suffer limb loss at the wanton decree of wind, fire, snow and ice. They exemplify stoicism. They are our life-dance partners and survivors in the global garden on Earth. These are the great ones. Master trees rooted in the wild-flowered, grassy earth that carpets the surrounds of comfortable old farmhouses, rock-strewn roadsides and city sidewalks, quiet parklands and deep woodlands across this nation. This exhibition, hosted by Queens Botanical Garden, features photographic portraits that fix in time the beauty of their long and generous life, captured in camera after they called me to their side and we shared quality time in conversation. Many inspired me to explore in the quiet of my Photoshop darkroom, the digital data beneath the image surface to discover and release the abstract inner essence of their spirit for all to see and enjoy. With great pleasure, I introduce you to my Portraits of Tall Friends. A unique combination of both visual and aural art, Mayen Alcantara’s intimate piece will take the audience on a journey through Queens. The multimedia exhibit is a series of sound installations, played on modified music boxes, and includes drawings and graphic musical scores. 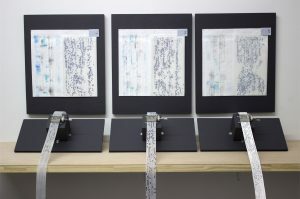 To create each piece, Mayen and a Queens resident wear “seismograph” devices to trace movements and gestures into markings, which Alcantara then turns into sheet music ribbons for participants to handcrank through music boxes. This collection of transcriptions is rooted in the moment when oral storytelling traditions overlap with modern-day record keeping.